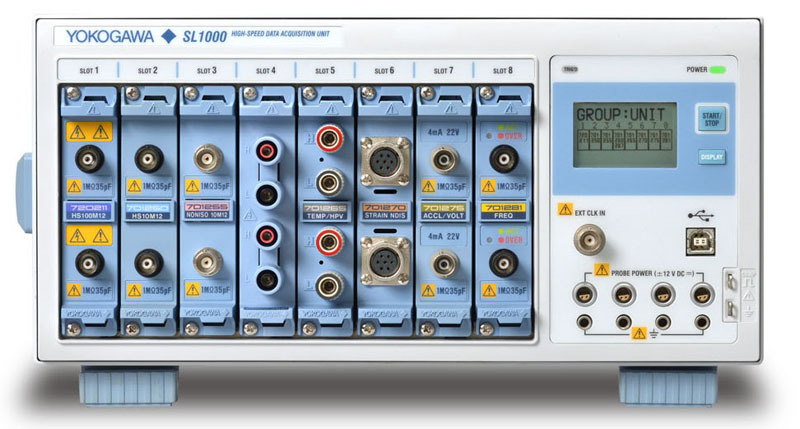 The SL1000 is a modular data acquisition system that delivers independent, isolated channel hardware at high speeds up to 100 MSamples per channel, with no compromise in bit resolution, memory depth, or data streaming performance. Choose from a wide variety of I/O modules for electrical and physical sensor signal measurements to meet the needs of any high channel count application. Selecting a data acquisition platform for electronics or mechatronics applications has always been a balancing act. 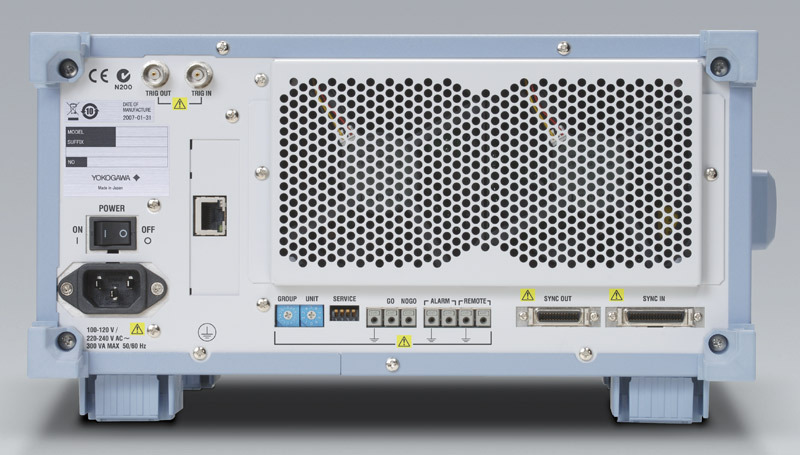 High speed digitizers lack the isolation, attenuation, or bit resolution necessary for power electronics testing. PC-based platforms with fast streaming throughput sacrifice noise immunity, signal conditioning, and hardware integrity. Until now. 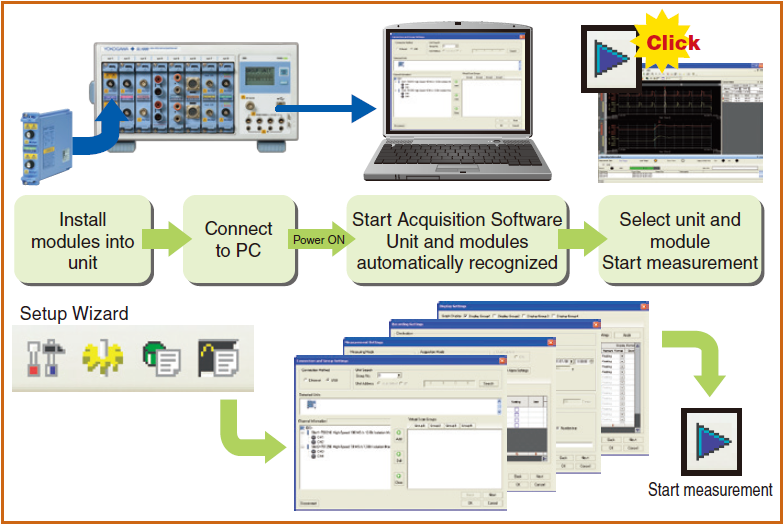 The new Yokogawa SL1000 is the only data acquisition system that delivers independent, isolated channel hardware at 100MS/ch rates, with no compromise in bit resolution, memory depth, or streaming performance. Speed of managing and acquiring data is the highlight of the SL1000. ³: Speed depends on PC performance and measuring conditions. In the pursuit of isolated high-speed waveform measurements, Yokogawa has achieved a maximum sample rate of 100 MS/s (10 ns sampling interval). 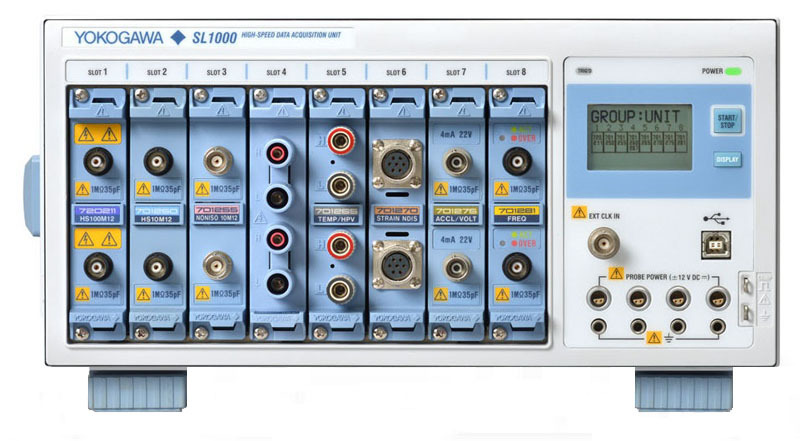 The SL1000 can accurately capture high-speed and high-voltage phenomena by using the newly developed 100 MS/s, 12-Bit resolution, 20 MHz frequency range and 1-kV * Isolation Module (model 720211). 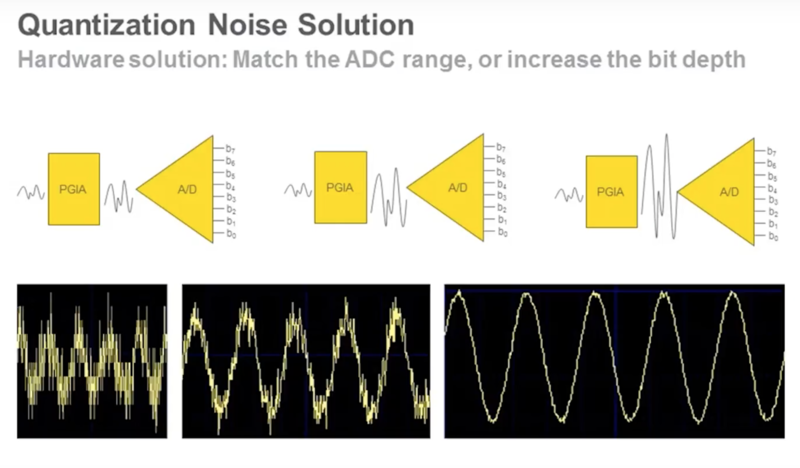 Furthermore, you can combine modules that support measurements of a variety of signals, giving you solutions for an extensive range of applications. Data can be saved to the SL1000’s internal acquisition memory over long durations, or it can also be streamed in real-time to a PC's hard disk or the SL1000’s internal hard disk ¹ ². 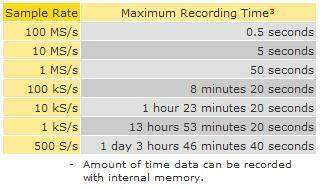 ²: Maximum speed of real time hard disk recording depends on measuring conditions. ³: Trigger mode: Single, measuring on 1 module, 2 channels. Perform measurements with up to four simultaneously independent sample rates. 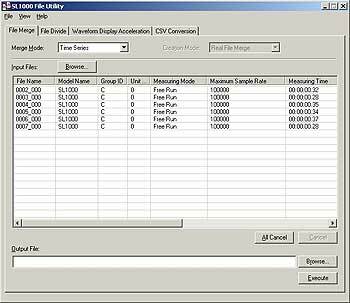 The amount of data saved on hard disk can be reduced by optimizing the sample rate for the DUT on a module by module basis. You can transfer data to the PC at high speeds via USB 2.0 or Ethernet 1000BASE-T Gigabit Ethernet¹. The SL1000’s high-speed data compression engine (GIGAZoom engine) displays waveforms on the PC in real time² (even with massive amounts of data at high sample rates). It offers the same display updating and zooming performance as standalone measuring instruments. 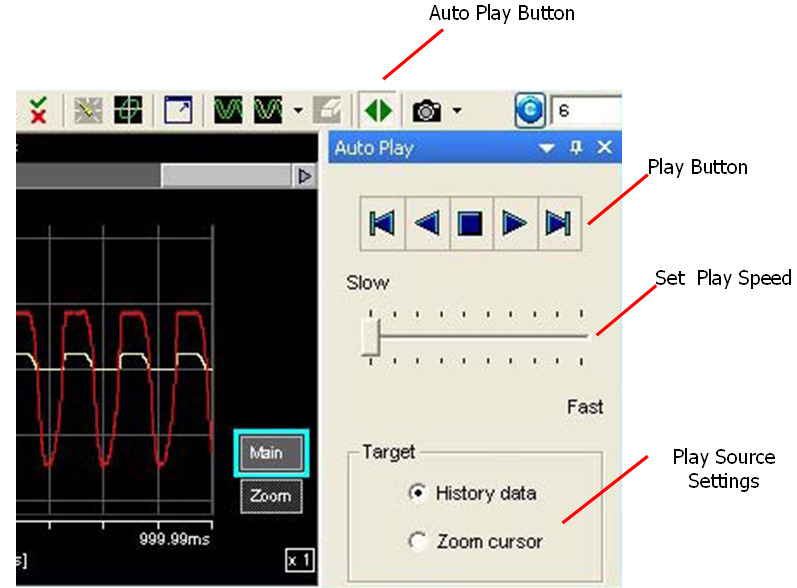 ²: The number of channels from which waveforms can be displayed during measurement may be limited depending on the PC performance and measuring conditions. Continuously measured data can be saved in real time to a PC's hard disk and/or the SL1000's internal hard disk ¹. File names are assigned automatically, freeing you from time consuming file operations. Data can be saved simultaneously - and in real time - to both the PC’s and SL1000's hard disks ¹. This bolsters the reliability of your data storage system, protecting your vital data. You can access the SL1000's internal hard disk ¹ with Xviewer waveform viewer software, or through an FTP client over Ethernet ². ³: Typical values. Actual values depend on PC performance and measurement conditions. By using the various recording features, you can efficiently and automatically record only the data you need to the hard disk. Just specify the recording destination, recording start and stop conditions, conditions for repeating recording, and other criteria. 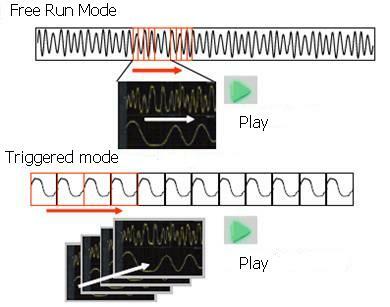 With free run mode, the specifiable parameters for the recording start condition are immediate, time, and alarm; for the recording stop condition, the parameters are continuous, time, recording time, and alarm; and for the repeating condition, recording interval and number of recordings*. With triggered mode, measured data is recorded on each trigger. You can also manually save data from the SL1000's internal acquisition memory to PC hard disk. In synchronized unit mode, recording into PC and SL1000 embedded HDD at the same time is not possible. You can input the comments in the mark area when monitoring (Free run mode) over long periods of time. You can input the comments in the mark area when monitoring (Free run mode) for a long time. You can now see both the T-Y and X-Y waveform Display. It is easy to evaluate data with fast update. 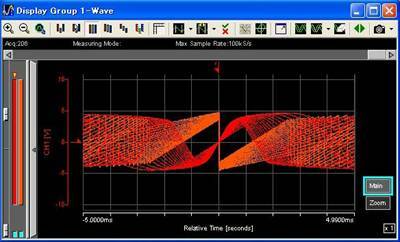 It is easy to set zoom position of waveform when measuring over long periods of time data or large data. You can save the data in both ASCII and Binary format. You can also load data with the same analysis program (ex. MatLAB). You can easily detect unevenness or changes in acquired data. The Wizard automatically recognizes any connected SL1000 and its' plug-in modules. Just click the Start button to start measuring right away - no complicated settings to enter. The four screens of the Setup Wizard guide you easily through detailed settings for configuring the system, measuring, saving and displaying. Of course, you can save and recall your settings at any time. Up to four groups of measurement channels can be defined with individual measurement conditions and display settings. Even waveforms from groups with different sample rates can be displayed in the same window. Measurement conditions and channel display settings can be viewed and set easily using a tabular format. Use drag and drop shortcuts to quickly setup multiple channels. Measurement and saving can be started and stopped using the same familiar buttons found on a DVD remote control. Start using the instrument on the same day you receive it, with absolutely no programming required. You can display a zoomed portion of the waveform simultaneously with the overall waveform during triggered measurement. Even during live recording, you can use the display hold * to review past data. You can also perform cursor measurements or automated measurement of waveform parameters (up to 26 during triggered measurement) in real time. *: The display hold may automatically switch to display resume depending on the measuring conditions. Adjust your vertical display scale with ease using mouse shortcuts. Adjust your vertical display scale with ease using mouse shortcuts.The File Transfer Function transfers files from the SL1000 to PC via, the Acquisition Software, intelligently in the case of multiple synchronized units. 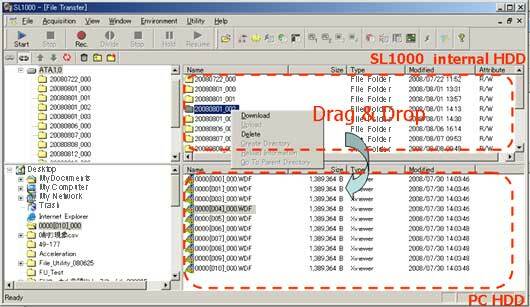 SL1000 File Utility is file processing software for manipulating acquired files before analyzing waveforms with Xviewer. It can also analyze multiple channels across several units at the same time. * SL1000 File Utility is bundled with the SL1000 standard install CD. Xviewer is a PC software application designed to work with Yokogawa’s digital oscilloscopes and ScopeCorders. MATLAB WDF Access Toolbox enables the access to waveform data files saved in WDF format on MATLAB. To control the instruments on MATLAB, please use Instrument Control Toolbox provided by MathWorks. Applicable to DL850 series, DL750 series and SL1000. Applicable to DL350, DL850 series, DL750 series and SL1000. Strain Module, type NDIS (2 channels) to be used in combination with 701955 or 701956 NDIS bridge head. Using the strain module and strain gauge the ScopeCorder can detect and display mechanical stress (strain). It works on the principle that the resistance value of a metal foil changes as it expands and contracts. Strain Module with Shunt Calibration, type DSUB (2 channels) to be used in combination with 701957 or 701958 DSUB bridge head. Accepts direct input from a built-in amp type acceleration sensor to measure acceleration. Sensor supply current (voltage) OFF/4 mA ± 10% (approx. 22 VDC) Applicable acceleration sensor type: Built-in amplifier type, Kistler Instruments Corp. : PiezotronTM, PCB, Piezotronics Inc. : ICPTM, Endevco Corp : IsotronTM. Applicable to DL350, DL850 series and SL1000. IsoPRO technology enables 1kV isolated measurements in combination with 700929 or 701947 probe and is designed for inverter / IGBT related applications in mind. Using high speed optical fiber-based transmission, the module achieves high speed ADC clock and data isolation and provides the performance needed to develop high efficiency inverters, which employ high voltages, large currents, and ever increasing switching speeds. The 720250 Voltage Module has a 10 MS/s sample rate, 12-bit resolution, 3 MHz bandwidth, 2 isolated channels, a maximum input voltage (DC+ACpeak) of 800 V*2, 200 V*3, DC accuracy of ±0.5%, and high noise immunity. 0.1°C (Temperature) resolution, 15 Hz bandwidth, 2 isolated channels, a maximum input voltage (DC+ACpeak) of 42V, DC accuracy of ±0.08% (Voltage), and thermocouple (K, E, J, T, L, U, N, R, S, B, W, iron-doped gold/chromel), high sensitivity range (0.1 mV/div), and low noise (±4 µVtyp.). The 720268 High Voltage Module has a 1 MS/s sample rate, 16-bit resolution, 300 kHz bandwidth, 2 isolated channels, a maximum input voltage (DC+ACpeak) of 1000V*9 *11, DC accuracy of ±0.25%, and AAF, RMS, and high noise immunity. The 720281 Frequency Module has a 1 MS/s sample rate, 16-bit resolution, bandwidth of resolution 625 ps, 2 isolated channels, a maximum input voltage (DC+ACpeak) of 420 V*2, 42 V*3, DC accuracy of ±0.1% (Frequency), and measurement frequency of 0.01 Hz to 500 kHz. The measured parameters are frequency, rpm, period, duty, power supply frequency, distance, and speed. T-adapter for BNC connectors. Use for circuits having voltage levels no greater than 42 V.
BNC-BNC 1m. For connection to simultaneously measurement with 2 units, or for input external trigger signal. BNC-BNC 2m. For connection to simultaneously measurement with 2 units, or for input external trigger signal. A 1 m long BNC-alligator clip cable. Use only for circuits having voltage levels no greater than 42 V.
A subassembly of 1.2 m long test leads with alligator-clip adapters. Applicable for SL1000 & SL1400. Differential probe powered by Yokogawa Digital Oscilloscopes, ScopeCorders, external power supply or internal battery. Differential probe powered by internal battery. Please see also 701947 & accessories. 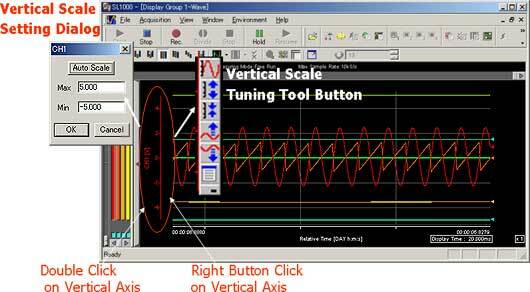 Functions with Digital Oscilloscopes, ScopeCorders and other waveform measuring instruments. High Voltage Differential probe powered by Yokogawa Digital Oscilloscopes, ScopeCorders, external power supply or internal battery. Current probe powered by Yokogawa Digital Oscilloscopes, Scopecorders or external power supply. A power supply for current probes, FET probes, and differential probes. Supplies power for up to four probes, including large current probes. Set contains one black and one red clip. Safety-terminal-binding-post adapter. Use for circuits having voltage levels no greater than 42 V.
A set of 0.8m long red and black test leads, used in combination with a pair of optional 758922 or 758929 alligator-clip adapters. Adapters for fitting a 4mm banana plug to a fork terminal. Set contains one black and one red clip. 1000 Vrms-CAT II. Two adapters in a set (spring-hold type). Applicable for DL750/DL750P, SL1000 & SL1400. Rated at 1000V. Attaches to the 758917 test leads. Sold in pairs. Screw-fastened adapters. Two adapters in a set. 1.5 mm Allen Wrench. * Cable only works with newer 700924, 700925 and 701921 probes that indicate "6VDC or 9VDC"at the probe input power connector. There are several factors for a user to consider when using an IEPE accelerometer, particularly when used with newly available integrated signal conditioner/data acquisition systems. Correctly managing these factors will help the user avoid erroneous data from their IEPE accelerometer and ensure the quality of the measurement data is at the level they expect and require.